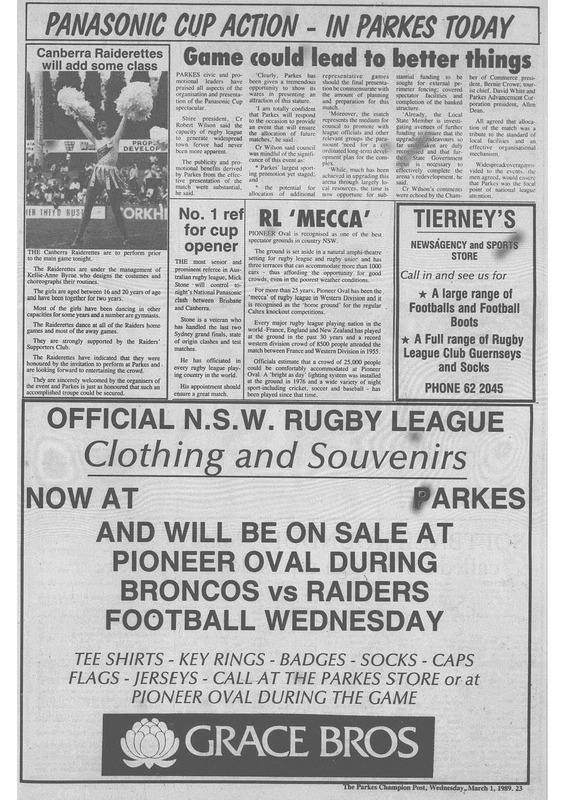 Today Pioneer Oval is the home of the Parkes Spacemen – the Shire’s representative team in Country Rugby League (CRL) Group 11. However the land known as Pioneer Oval has had name changes and indeed many uses for other sports and recreational activities. 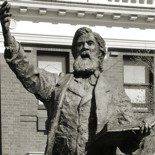 History Parkes continues to look at the people and events relating to Pioneer Memorial Oval. 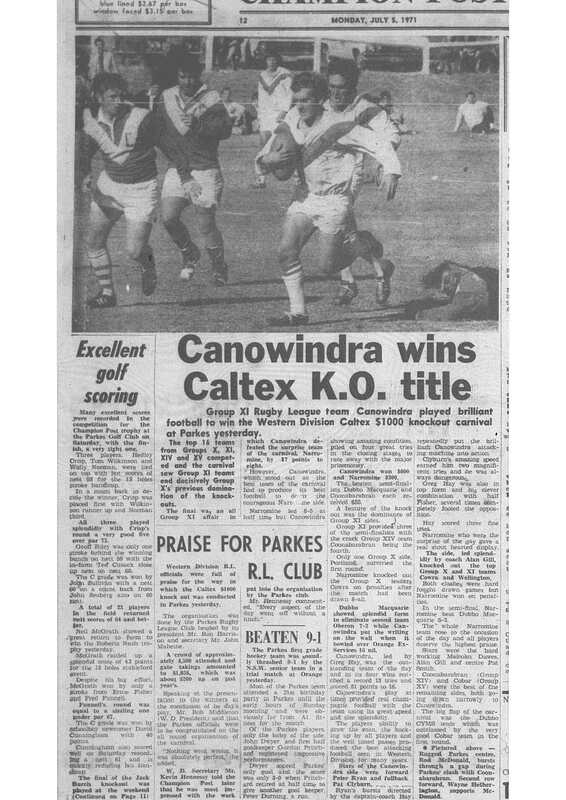 1971 Caltex Knock Out was hosted at Pioneer Memorial Oval. 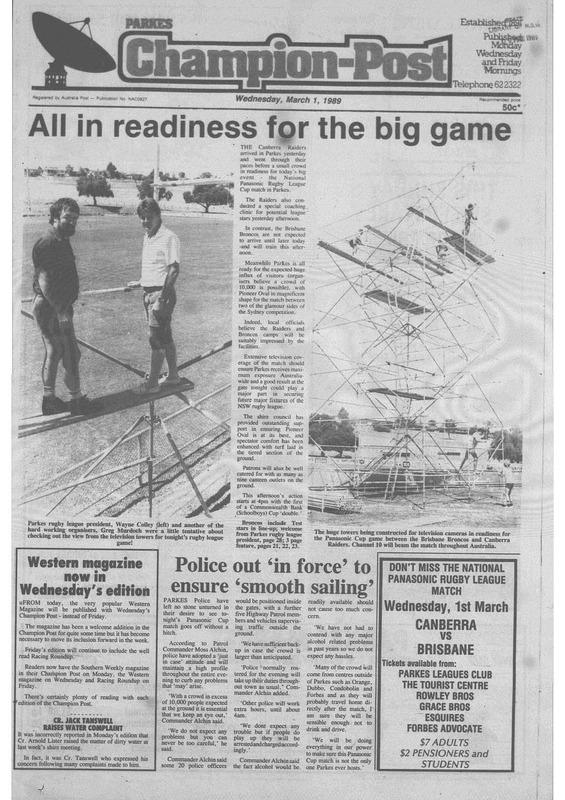 Parkes Champion Post 5 July 1971 article includes Western Division Rugby League officials praising the efforts of Parkes in hosting the competition. The previous decade seemed bereft of international superstars running on Pioneer Memorial Oval’s turf, especially in comparison with the 1950s and 1960s. 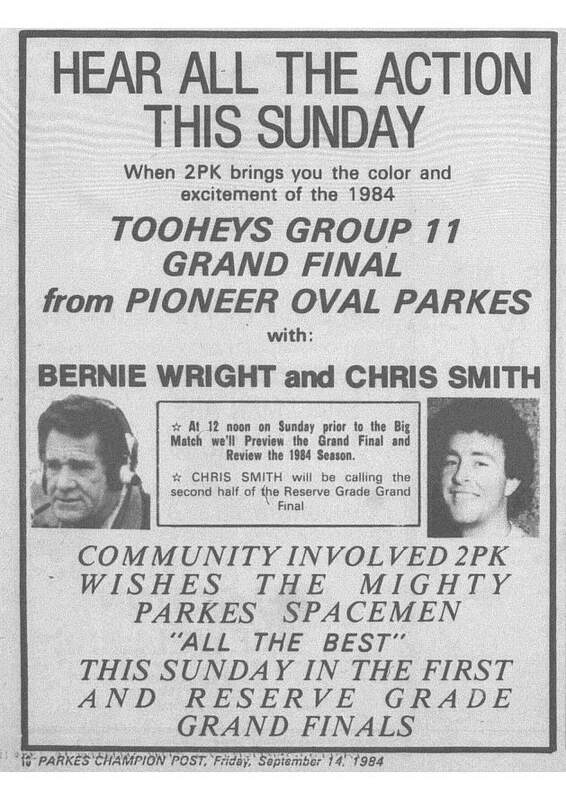 By the end of the 80s, the superstars were returning to entertain those who attended Pioneer Memorial Oval. 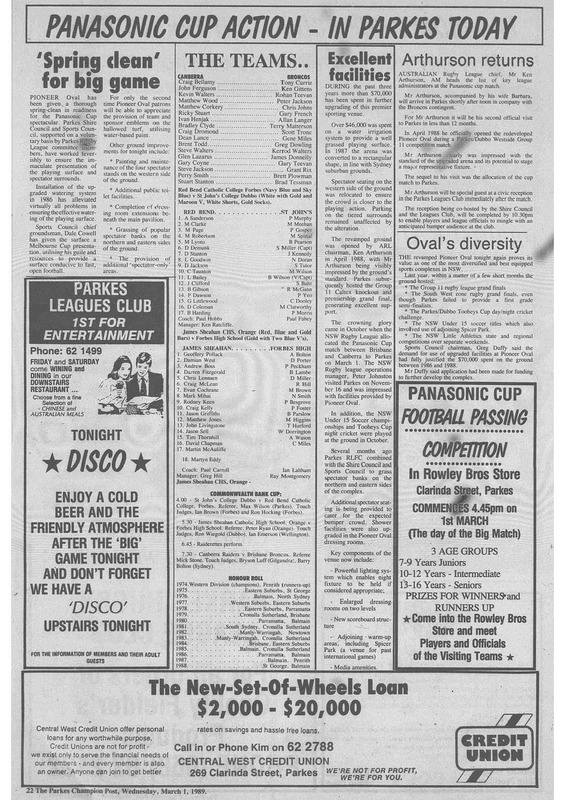 1984 was a big year for Pioneer Oval with grand finals being played for rugby league and rugby union. 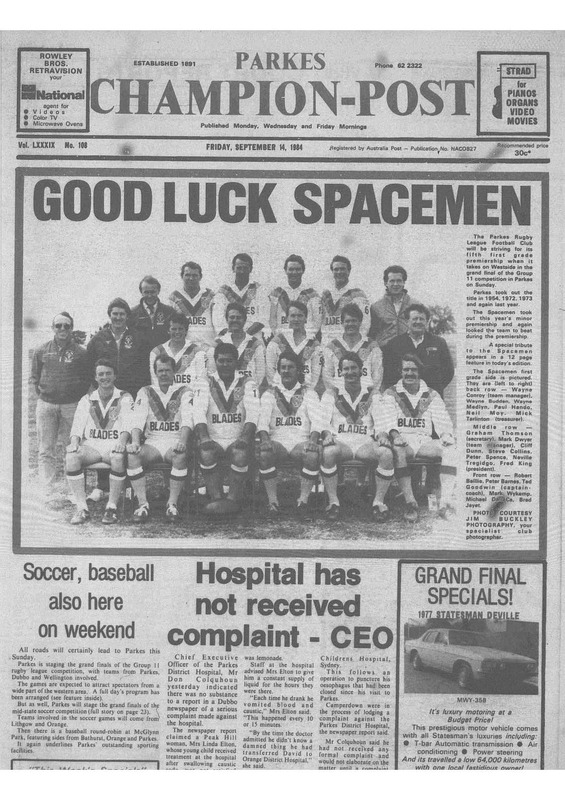 Parkes Boars reserves were runners up but the Spacemen won both first grade and reserve grade in rugby league. 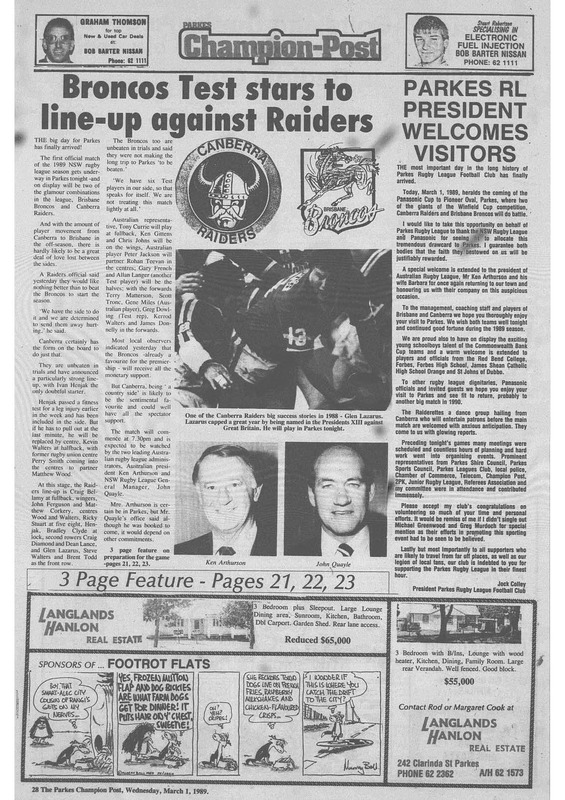 Front page of Parkes Champion Post Friday September 14, 1984. 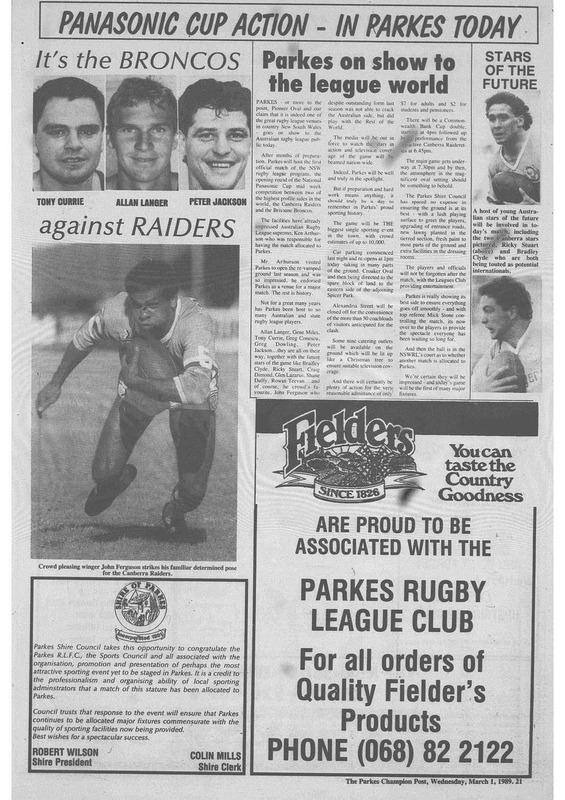 Parkes’ claim as a sport-obsessed town is highlighted by the report on soccer and baseball being hosted in the shire. 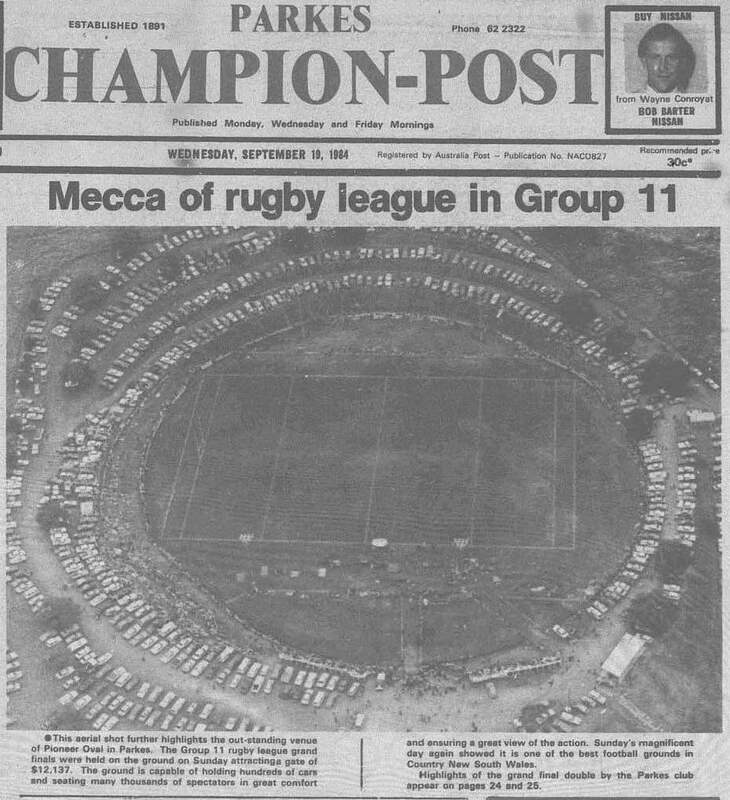 Mecca of rugby league in Group 11, Pioneer Memorial Oval. 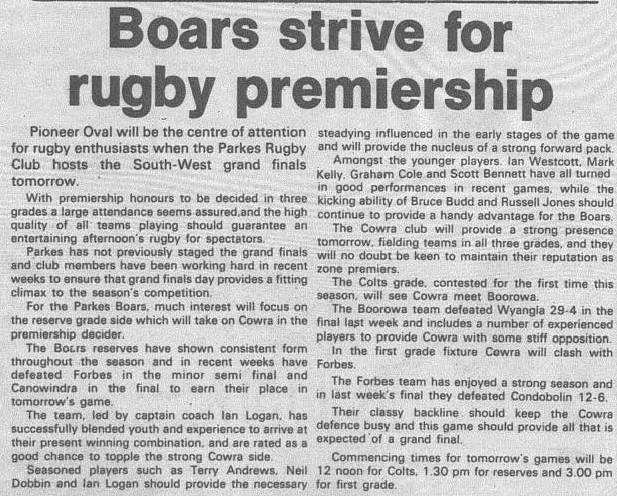 Source: Parkes Champion Post Wednesday September 19, 1984. 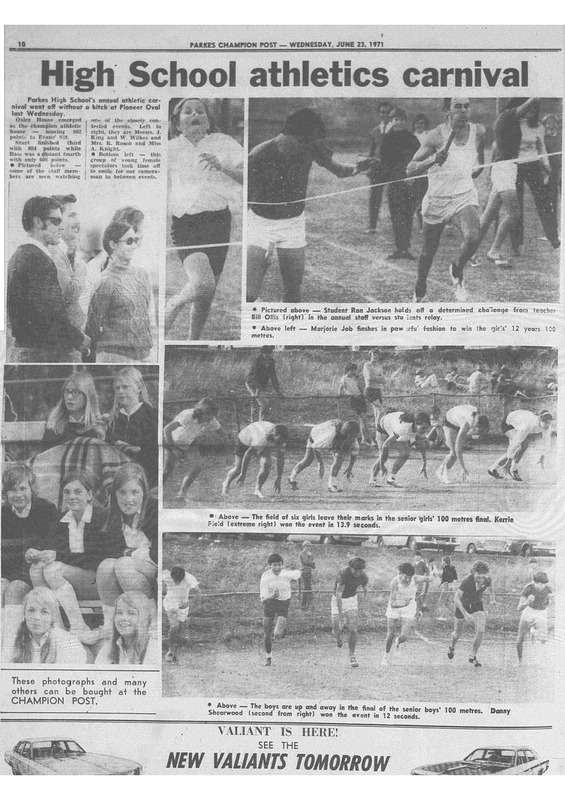 Aerial photographs of grand finals at Pioneer Oval were a regular occurrence from the 1970s onwards. 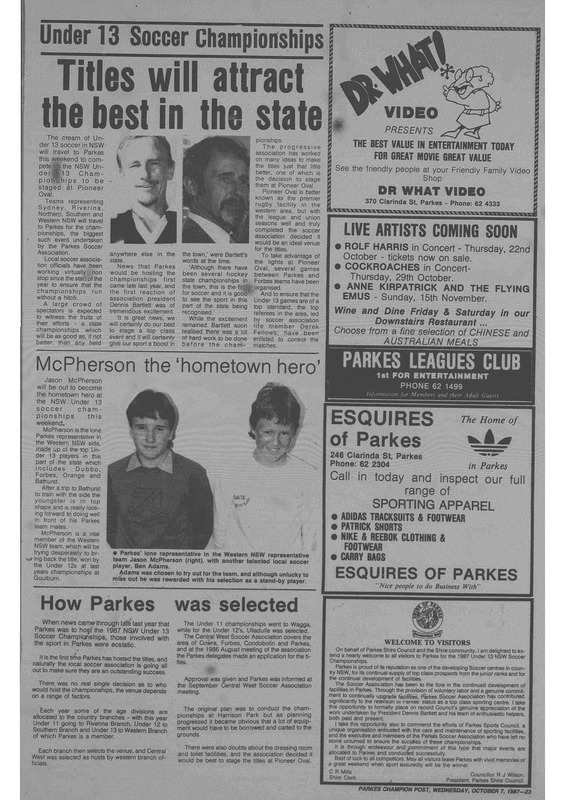 Parkes Champion Post Wednesday October 7, 1987 detailing the importance of the tournament and how Parkes was selected as hosts. 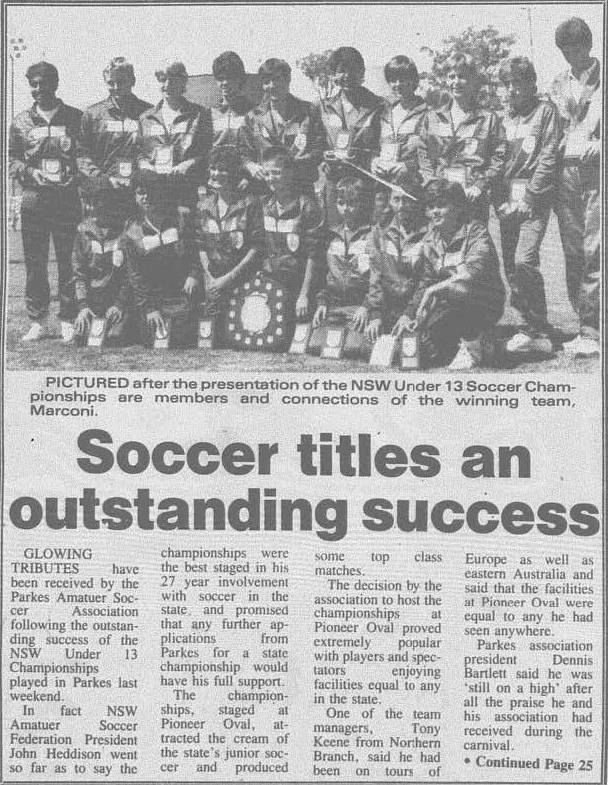 Parkes Champion Post Wednesday October 18, 1987 reporting on the success of Parkes in hosting the Under 13s Soccer titles at Pioneer Memorial Oval. 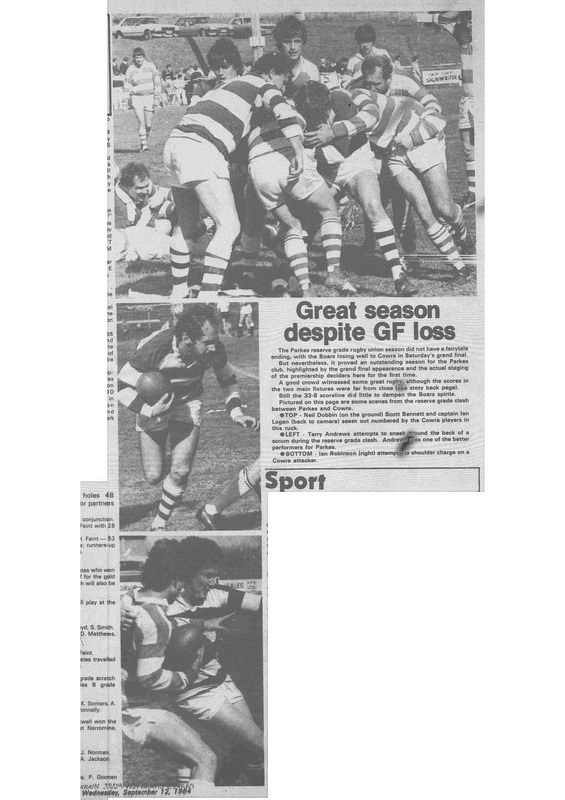 The decade’s highlight for residents of the Parkes shire was the upcoming Panasonic Cup game between rugby league heavyweights Canberra Raiders and Brisbane Broncos. 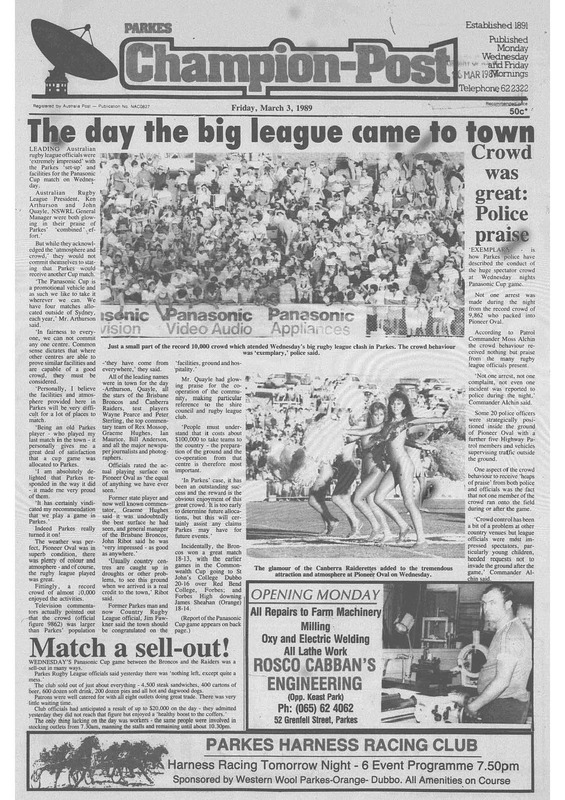 A crowd of 10,000 turned up to watch two teams full of international superstars of rugby league ply their trade on local soil. 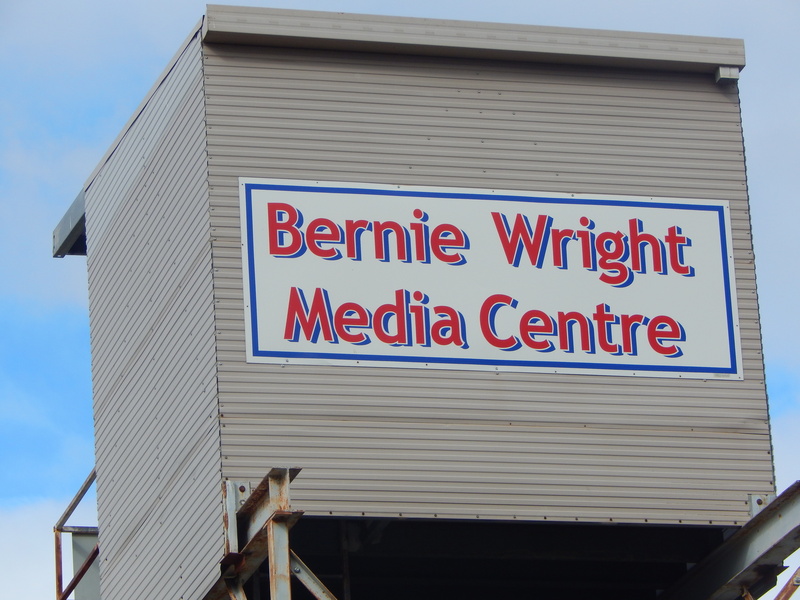 This entry was posted on November 17, 2015 by parkeslibrary in 1970s, 1980s, football, General history, Panasonic Cup Rugby League, Parkes, Parkes High School Athletics Carnival, soccer, sporting fields, Uncategorized and tagged athletics carnival, Bernie Wright, Boars, Brisbane Broncos, Caltex Knock Out, Canberra Raiders, crowd sell-out, floodlighting, full house, Panasonic Cup, Parkes High School, Spacemen, Under 13 Soccer Championships.